The theme adopted in the exhibition is "Nature and History: Portugal where the land ends and the sea begins." One variation of this theme, "The sea and the lands," depicts the annals of contact between Portugal and Asia, including Japan. In the routes of gastronomy, for instance, the exhibits show the influence of Portuguese cooking and Asian cooking (spices in Portuguese food, "tempura" in Japanese cuisine). In the routes of art, the exhibition presents Japanese and Portuguese paintings of the 16th and 17th centuries. The second theme variation, "Portugal and Japan," tells how the Portuguese introduced guns to Japan, and depicts the nature and food in Japan as seen through the eyes of Luis Frois in the 16th century and Wenceslau de Moraes in the 20th century. 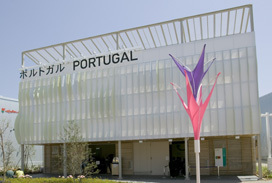 A third section of the exhibition, "Portugal and the Four Elements," presents the latest Portuguese projects in development of natural resources and in international cooperation. The restaurant in the Portugal Pavilion consists of a long counter where visitors can taste and buy Portuguese cold food specialties such as codfish cake and octopus salad, accompanied by Portuguese wines and other drinks. There is takeout food prepared in a carefully designed lunch box known in Portuguese as "poruben," or a Portuguese style of "bento." The pavilion store provides a variety of traditional gourmet food and drink with emphasis on carefully selected organic products. As souvenirs, visitors have a choice of music, books, handicrafts, tableware and new eco-design products that illustrate Portuguese traditional and contemporary culture and the exhibition theme.